Status: Inactive as this identity, beyond that, his current status is unknown. Occupation: let's start with beatnik, the rest is loose and free-flowing man. An acrobatic and jive talking beatnik hero. He aided Honor Guard in the first fight against Shirak. 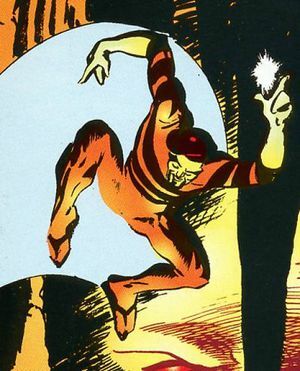 There is a definite sense of a long history associated with the Bouncing Beatnik, but to date, he has made very few on-panel appearances within the pages of Astro City comics. At least in this form, with this identity. According to a Pyramid computer file, he took down a Pyramid base in Los Angeles in the mid 1960s. On Bruiser's, the (now discontinued) Comics Forum dedicated to all things Astro City, Kurt mentioned, "There will eventually be more of the Beatnik -- or another of his incarnations. He has shown up in two forms, so far." Astro City: A Visitor's Guide notes he's never been an Honor Guard member in any of his incarnations. He's teamed up with them, but never joined. He has a yellowish/golden skin color, and only three digits on each hand, indicating he's not completely human. The Broken Man confirms the Beatnik is part of the legacy that began with Mister Cakewalk, i.e. an incarnation of living music that manifests as part of a particular era's counterculture. People don't seem to like him for some reason. According to the Broken Man, this is key to something. In 1959, the Bouncing Beatnik teamed up with Max O'Millions' freshly formed super-hero team, Honor Guard to turn back a dimensional invasion by Shirak the Devourer. It seemed a rather odd collaboration however, given the cultural differences and fighting styles between the Beatnik and Honor Guard, especially with Max O'Million. Follow up commentary about the battle from reporters who frequented a local pub appropriately called the Deadline, strongly reinforced this notion. The Halcyon Hippie as depicted in the early 1970s might be a subsequent presentation of what was the Bouncing Beatnik. Fan commentary and letters page response to his first appearance (Kurt Busiek's Astro City Vol.2 #1/2) hint that he might be an alternate reality's version of the Beatnik. A repeat appearance in Astro City: The Dark Age Book One #4 strongly infers that the Halcyon Hippie is of this dimension as well. Based on certain physical similarities, it is possible that in addition to being the Halcyon Hippie, he could also have another identity as the Broken Man. ↑ Astro City: The Dark Age Book Three #1. Page 14. Panel 2. ↑ Kurt Busiek's Astro City Vol.1 #2. Page 20. This page was last modified on 28 August 2018, at 23:25.